AC/DC drummer Chris Slade is addressing ongoing rumours that the band are planning to record a new album with Axl Rose in a new interview with Duke TV. "My lips are sealed,” laughs Slade. “And if I knew, I couldn't say a word anyway. What I usually say is ‘If I tell you, I have to kill you.’ Which, perhaps, is not in good taste. I couldn't even start to answer that, I'm afraid." Rose stepped in to help the band complete the final 2016 dates of their world tour in support of 2014’s “Rock Or Bust” when the trek was temporarily halted after singer Brian Johnson was advised by doctors to stop performing in arenas and stadium-sized venues immediately or risk total hearing loss. The latest in a series of reports out of Australia quotes Rose Tattoo vocalist Angry Anderson as saying that Angus Young revealed his plans to work with Rose when the pair chatted during a series of Guns N’ Roses shows in the country early last year. Rose’s 2016 stint with AC/DC saw the band add several classic Bon Scott-era tracks to the set, including "Rock 'N' Roll Damnation", "Riff Raff", "If You Want Blood (You've Got It)" and “Touch Too Much." "Axl, he actually asked… I was standing right next to him when he asked Angus, 'Can we do these songs?'" explains Slade. "And I love playing 'Riff Raff', and I always have. In fact, we do it with [my solo band] Timeline. All those songs were great, and the fans loved them — absolutely loved it. Because they'd like to hear those songs too. “Axl is a big fan, you see, and still is, of AC/DC. Those are songs that he would like AC/DC to play… Of course, they're old songs, but new for the band playing onstage. I don't think they played 'Riff Raff' on stage for about 25 years, maybe even 30. I know they used to open with it, didn't they? But they hadn't played it since then." 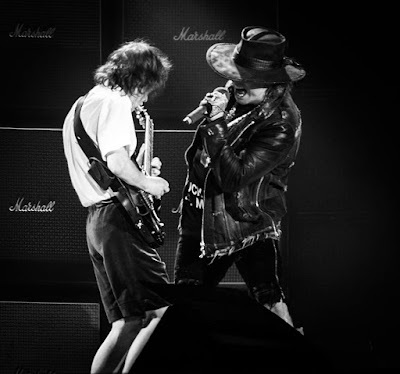 While there’s been no official update on AC/DC’s plans to date, Rose will regroup with Guns N’ Roses for a 7-week summer tour of Europe that will begin in Berlin, Germany on June 3 and wrap up in Reykjavik, Iceland on July 24.